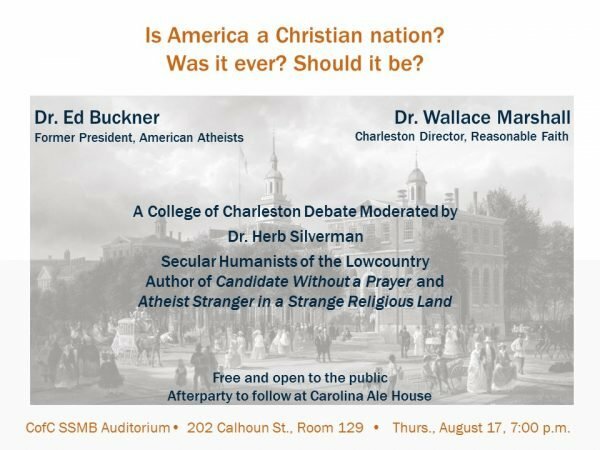 This debate will be moderated by Dr. Herb Silverman, the founder and president emeritus of the Secular Coalition for America and a Professor Emeritus of Mathematics at the College of Charleston. The debate is scheduled for 7:00 PM on Thursday, August 17. The debate will be held in room 129 at the School of Sciences and Mathematics Building at 202 Calhoun Street, Charleston. A map is located below. The most convenient parking for this event will be at 81 St Philip Street. Additional parking is a few blocks away at 34 St Philip Street.